I need to apologize in advance for what you're about to read. I'm about to gush about a game. I'm going to gush hard. 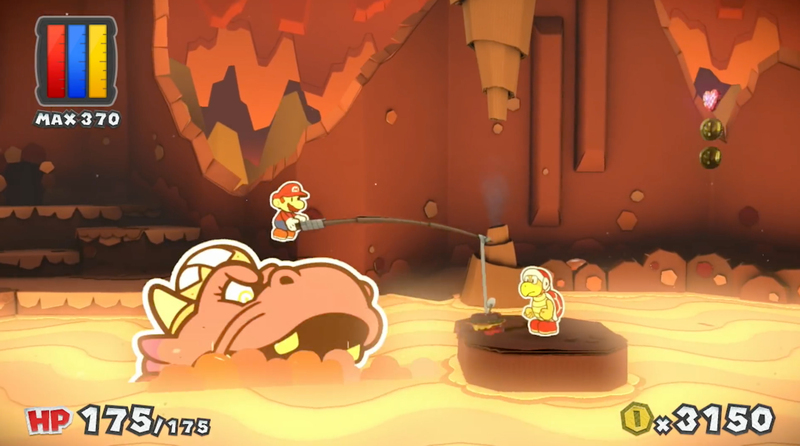 I'm going to gush about its graphics, about its music, about its humor and about all the improvements it made over Paper Mario: Sticker Star. I don't like to be the reviewer who just adulates games, but it's hard not to when you have an experience that consistently puts a smile on your face. Don't worry, I'm going to dig into the stuff I don't care for, but looking at my time with the game as a whole I have to say – to quote Carly Rae Jepsen – I really, really, really, really, really, really, like Paper Mario: Color Splash. 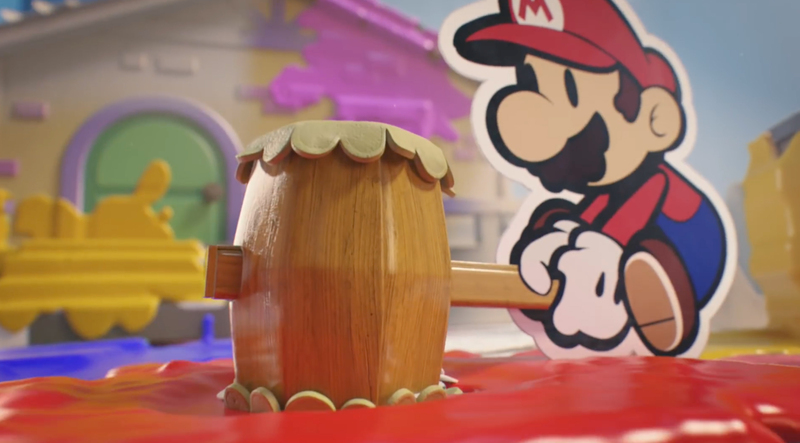 If you have seen the trailers for Paper Mario: Color Splash and thought it looked like another great RPG for the Wii U, I'm going to stop you right there. Despite making improvements to the battle system over Sticker Star, this game is still decidedly an adventure game. An adventure game with turn-based battles, sure, but an adventure game nonetheless. Nintendo refers to it as "action-adventure," but I'll argue it is at its best when it drops the action and focuses on the rich storytelling and puzzle solving aspects of the adventure genre. That's right, I said "rich" storytelling. In one of the many improvements over the previous title, Color Splash tells an interesting story, with interesting characters doing interesting things. The overall plot of the game is pretty basic and quickly turns into your standard Mario story of the mustached man trying to save a princess from the big evil turtle. At this point, that plot is to be expected, but it wasn't what kept me glued to the game. I was far more interested in the little things, the individual stories and vignettes found throughout. Whether I was helping ghosts at a haunted hotel, cooking a steak until I got it just right, setting sail with a bunch of pirates looking for fame and fortune, or answering questions in an underwater game show, I was completely enchanted with each of these little acts found in each level of the game. I was also laughing for most of it because the script here is hilarious. Nearly every NPC present has a one-liner that cracked me up and the personalities of these characters are so diverse. Sure, they look the same because they're all just toads and Shy Guys, who I am happy to see play such a major role here, but when the writing is as on point as it is here, it doesn't matter what you look like. You could look like a paint can and still be the best character in the game. In fact, a paint can is the best character in the game. Huey, your Kersti-esque companion for this adventure, is amazing. He's overflowing with charisma, always quick with a joke, and not afraid to berate Mario, but when he does it's priceless. You can tell the folks at the Nintendo Treehouse had fun with this one, especially when you consider the 30 years worth of Mario material they call upon in the many references characters make. It's not all comedy, though. There is also many poignant moments that somehow found a way to tug at my heart strings. Part of that is each scene was accented by the perfect music for the situation. Color Splash has one of the best and most varied soundtracks I've heard in some time. Sea chanties, country western, reimaginings of classic 8-bit tunes – it's all just wonderful. Even the repetitive battle track isn't that bad, but my absolute favorite is the music from Dark Bloo Inn, which has a soundtrack straight out of a Tim Burton film. Not the new, crappy Tim Burton films, but the amazing late 80s/early 90s Tim Burton films. I literally stopped playing because I didn't want any sound effects to get in the way of my enjoyment of the music. Of course, it's not just a treat for the ears. 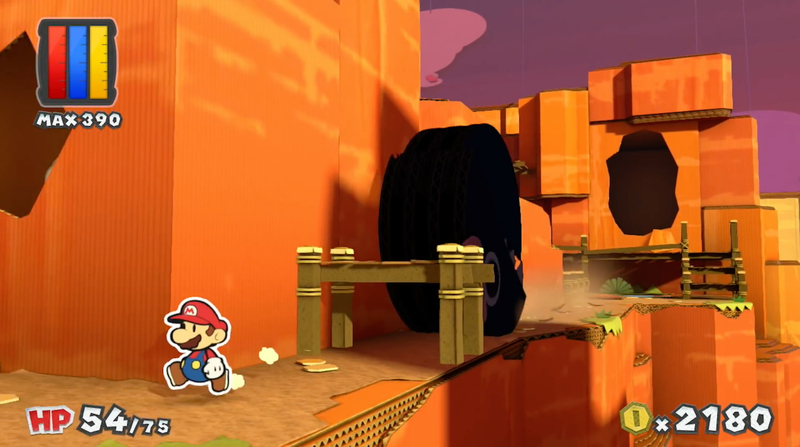 Paper Mario: Color Splash is the best looking game I've ever played. It's so vibrant, so full of color and it genuinely looks like you're playing in a real diorama. The game plays with color in fun ways, such as having the colors run on wet characters. Intelligent Systems uses the full power of the Wii U here to create the vivid landscapes it envisioned for this project, but perhaps the developers were too ambitious as I did notice multiple instances of slowdown. None of it was during the actual gameplay, so it didn't affect me, but it did lessen the beauty of this game ever so slightly. The excellent aesthetics actually factor into how you play the game. 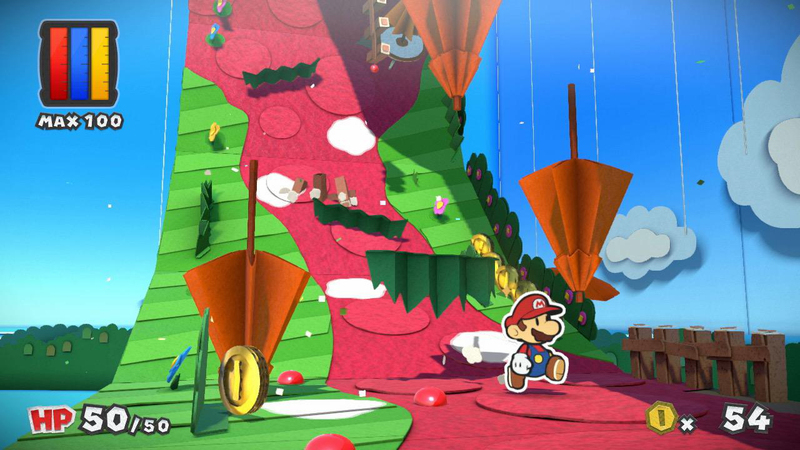 The main objective of Color Splash is to restore color to Prism Island after an army of Shy Guys sucked the land dry. To do so, you need to collect the six paint stars that have been scattered throughout the land. You'll venture from level to level on an overworld map, and each level will have one or more mini paint stars you need to collect in order to find your way to the big paint stars, which are all guarded by a boss character. In most levels with multiple mini paint stars, they'll be spread out so you don't have to traverse the entire thing more than once to get all of them. There are a few levels that annoyingly force you to do so, though. In each level, you'll spend your time exploring and battling with your deck of cards. Actually, that's not true. 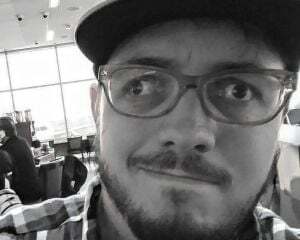 There are a few levels where I didn't have to fight a soul – wait, do Shy Guys have souls? Anyway, exploration here plays like past Paper Mario titles. You're a 2D character in a 3D world, armed with a hammer you can use to whack enemies, smack question mark boxes, or break down walls. You can also use your hammer to paint the scenery. There are hundreds of patches of white that need to be colored in, as well as dozens of Toads that have to be restored. Objects that you can interact with can't be used until they are colored in. As you color the land, you'll drain the available paint in your hammer, but this can easily be restored as hitting nearly everything in the environments will net you a couple drops of paint. There are many puzzles to be solved along your journey, most of which will utilize the touch screen cutout feature. Is there a spot on the map you can't reach? Make like Uncle Joey and cut it out. The cutout tool will not only help you reach every nook and cranny of each level, but will also allow you to advance past any portion of the story where you have to take one of your cards and apply it to the stage itself. I can see the combat being the most divisive part of the game, yet again. Nintendo describes the turn-based battles as "puzzling," but they're not. If anything, you're just doing the same puzzle again and again. Color Splash switches out stickers from the last game for cards, but it plays roughly the same. Each battle starts with you selecting as many cards as you can from the touch screen, painting it if it's without color, and flicking the cards into battle. It's important to paint your cards because the less color there is, the less powerful your attack will be. From there, just like any other Mario RPG, you have to time presses of the A button correctly to get the most out of every attack. The biggest complaint about the last game was that the was no point to fighting. Because stickers were prevalent throughout the Mushroom Kingdom, there really was no point to doing all those battles just for coins. At first, I thought it would be the same here, but the rewards you receive for stomping and smashing the familiar crop of Mario baddies are actually useful. There are coins which you will need if you don't pay attention to directions as I found out the hard way, but you also get paint to refill your hammer, enemy cards that you can't buy at the card store, and Hammer Scraps that upgrade the paint capacity of your paint hammer. It's not XP, but skipping over inessential battles might leave you unable to paint your attack cards during fights you can't skip. Boss battles are largely the same as the last game. Throughout your journey, you'll find various Things, like a break dancing piggy bank or a Kaiju fire extinguisher. Some of these Things are the key to winning battles against the Bowser kids. That means if you miss the Thing you need, there's no way to beat the boss. It frustrated me in the last game, where I still thought I was playing an RPG. Here, I was prepared for it. I knew that I had to have that specific Thing card in my deck to take them down. If I didn't, I could run from battle and go find it without seeing the Game Over screen. Using Thing cards in battle brings about the most vibrant set pieces found in the game, but I only used them sparingly. Part of the issue is you really never know just when you'll need one, either for a battle or to solve one of the many environment puzzles. You can prepare, there are hints you can find that will tell you the Thing you need to reach the next part of the game, but if you use that Thing in battle on purpose or by accident, as I did a few times when Kamek appeared and screwed with my deck, it means dragging Mario all the way back to Prism Plaza to buy a new Thing card or trekking to the spot where you originally found the Thing. Because Color Splash is absolutely littered with short loading screens, long journies across the map was something I tried to avoid at all costs. Adding to my issue with the cards is how they're laid out on the touch screen. You basically have just a straight line of cards that you have to scroll through until you find the one you want. It's a slow process that can make the battles drag on, especially when you have the maximum amount of cards in your deck. Would it have killed them to give us some folders here?